Historian Bruce Laurie will speak in conjunction with the exhibit Chaotic Freedom & the Scars of Slavery. In early April 1863, Northampton newspaper publisher Henry S. Gere wrote a letter from Baton Rouge for publication in the Hampshire Gazette describing the scarred back of an enslaved man named Peter. Gere and Marshall S. Stearns of Northfield were serving in the Union army and met Peter who had fled slavery and arrived at the encampment where they were stationed. Shocked by what they saw, Gere and Stearns collaborated to produce a photograph utilizing a new photographic medium called the carte-de-visite. Gere sent the photograph to bookseller Sidney E. Bridgman of Northampton for public viewing. Months later, a version of the image reached a national audience on the pages of Harper's Weekly magazine. 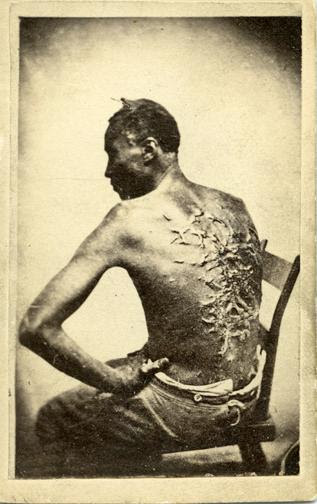 Today, the photograph is considered the most iconic image of an enslaved American. Peter was one of thousands of self-liberated men, women and children who entered the Baton Rouge camp. Stearns and Gere witnessed their plight and the disorder that followed emancipation. Historian Bruce Laurie chronicled this story based upon a set of 18 card photographs Gere brought home from Baton Rouge (now in the collection of Historic Northampton) and letters sent home by both men. His research is now paired with photographer Stan Sherer's photographic reproductions of the 1863 carte-de-visite images in the exhibition, Chaotic Freedom and the Scars of Slavery, part of the 2018 All Hamptons Read. All Hamptons Read is a community reading event for the residents of Easthampton, Northampton, Southampton, and Westhampton. All Hamptons Read is made possible with the support of: Edwards Public Library, Southampton; Emily Williston Memorial Library, Easthampton; Forbes Library, Northampton; Lilly Library, Florence; Westhampton Public Library; Historic Northampton; The David Ruggles Center; Commonwealth Museum; Northampton Community Arts Trust; and with additional support from Emily’s Friends of the Library, Friends of Lilly Library, Friends of Forbes Library, Friends of the Edwards Public Library, and Friends of the Westhampton Public Library. All Hamptons Read is a community reading event for the residents of Easthampton, Northampton, Southampton, and Westhampton.